Send along the best with this deluxe collection of gourmet delights from around the world. Carefully-aged Cantalet Dore, Sottocenere, and Petit Basque cheeses complement the heritage flavors of Jamon Iberico de Bellota and Toscano Fennel Pollen Salami. 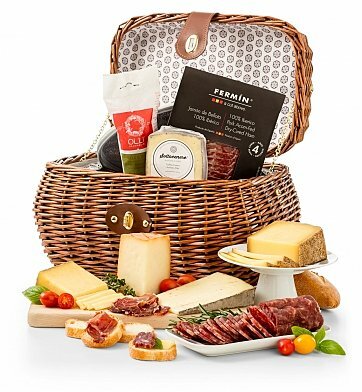 The gift arrives in a handsome tailored insulated hamper that makes for a lasting picnic-ready keepsake. Artisan Cheeses: Cantelet Dore, Petit Basque, Sottocenere. Charcuterie: Iberico Bellota, Fennel Salami. Each gourmet item is carefully assembled inside this tailored insulated hamper to safeguard the shipping process. A free card is included with your personal message or greeting, as well as complimentary scissors so your recipient can easily open their gift. Your gift will leave a lasting impression as they continue to use and enjoy this elegantly tailored isothermic cooler, perfect for day trips, picnics or an afternoon at the beach. Measures 6" x 10" x 11". if ordered by 12:00 am EDT Thursday April 25th. Deluxe Cured Meats and Imported Cheese Gift is a hand delivered gift. These gifts are delivered by one of our local design centers located throughout the United States and Canada. Same day delivery is available for most gifts when ordered before the cutoff time. The cutoff time for Deluxe Cured Meats and Imported Cheese Gift is in the recipient's time zone. Sometimes described as the French cousin of English Farmhouse Cheddar, Cantalet is a semi-hard cow's milk cheese that displays fresh buttery flavors when young then deepens into a sharp, earthy expression of its native Auvergne region as it matures. The paste is dense, rich, and creamy with a slight crumble that increases with age, while the rustic rind brings to mind the long history of the style, dating back 2,000 years to the time of the Gauls and coming to prominence at the table of Louis XIV. This is truly a heritage cheese worth savoring. Cantalet Dore complements a vast variety of reds, but for an off-the-path experience open a bottle of gold-toned Gewurztraminer and enjoy the interplay of sweet, aromatic wine with the umami-edged Cantalet. Though it may share a herringbone-patterned rind and an area of origin with the better known Manchego, Petit Basque is a sheep's milk beauty entirely its own. Succulent and creamy with a smooth, inviting paste, Petit Basque is less gamey and more approachable than many of its more "sheepy" brethren. Which is not to say it's simple; roasted nuts, stone fruit, and a subtle note of caramelized creme brulee shell all offer themselves to the attentive palate in a robust slice of this refreshingly young cheese from the Pyrenees. Match an agreeable wedge of Petit Basque with an equally generous bottle of Beaujolais Nouveau for an exuberant and immediate fruit forward pairing, perfect for an early evening cheese course or a late summer picnic. From the Northern Italian region of Veneto, this irresistible semi-soft cheese is pasteurized from cow's milk and laced with delicate flecks of truffle. The rind is rubbed in truffle oil and aged in a coating of nutmeg, coriander, cinnamon, licorice, cloves, and fennel. A thin layer of ash covers the spiced rind as the cheese ages, which is where this creamy cheese gets its name - Sottocenere essentially means "under ash". Aromatic, unusual and delicate, the silky indulgence of Sottocenere is perfectly suited to the sparkle of Lambrusco or an Italian Barbera. Cured Spanish and Italian Meats, Imported Artisan Cheeses. GiftTree's Signature Tailored Insulated Hamper. I gave this as a Christmas present to my sister and brother in law for Christmas and they loved it! They are also both retiring and will be going on some day trips so I thought the reusable thermal picnic basket would be perfect for them. Gift Tree never disappoints me , I also sent gifts to other relatives for Christmas this is my fourth year using Gift Tree. I may just send myself a gift so I can experience it myself lol! Very excited with basket & contents. Food was delicious, very special cheese selection. The slate cutting board is surprisingly hefty and high quality. The soft/insulated cooler (which includes a scissors and two reusable ice packs that fit into pockets) is a terrific item unto itself. Recipient loved the entire package. I highly recommend. I ordered this for my boyfriend for his 37th birthday and had it shipped to his work as a surprise. I was looking for something that would be KETO diet friendly as well as something for his mature palate. This fit the bill. FYI, this needs to be refrigerated upon delivery and was not mentioned anywhere on the site. Anyways, it came with a pair of scissors with which to cut the bow and my personalized note was attached to the scissors. "It's a very nice gift in a very nice lunchbox. It's well presented." He first commented on the quality of the board and real slate which are top notch. He has tasted a little bit of everything and has used the words exquisite, unique, and "Okay. Wow. Just wow." He's a very satisfied customer and has shared with his inner circle. Several coworkers have been asking him where he received it from from the looks and smells alone. I would recommend this for anyone looking for a unique gift for those with a mature palate so it can be truly tasted and enjoyed. Delivered for fathers day to Arizona 115 outside. Whole package melted! I called with out hesitation they sent a new one out to my dad for fathers day. GREAT CUSTOMER SERVICE !!!! Gift basket was delivered to my wife for the start of her birthday week and it was perfect. Amazing cheeses and meat, but what really got my wife was the awesome basket and cutting board. Great job on this and very classy. Thanks.